On December 17, 1950 the Cleveland Browns hosted the New York Giants in a playoff game to determine the champion of the NFL’s American Conference (the re-named Eastern Division). The Browns, coached by the innovative Paul Brown, had joined the NFL after dominating the All-America Football Conference, winning all four league titles before that league folded. Now in the older league, Cleveland had proven the skeptics wrong by compiling a 10-2 record. However, the Giants were the one NFL team that had solved the Browns, winning both regular season encounters. With identical records, they were meeting to determine who would move on to the league championship game against the winner of the National Conference playoff (the Rams and Bears tied for first as well). Cleveland had a well-balanced offense directed by QB Otto Graham and including the league’s rushing leader in FB Marion Motley. Ends Mac Speedie and Dante Lavelli were fine receivers. 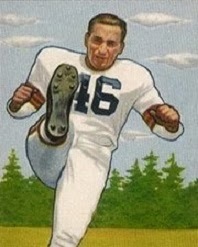 The Browns were tough on defense, too, and to top things off, Lou Groza (pictured above) was the NFL’s top placekicker, leading in both in number of field goals and accuracy. The demise of the AAFC was of big help to the Giants, as they were able to add some outstanding talent to their roster that included DT Arnie Weinmeister and defensive backs Otto Schnellbacher, Harmon Rowe, and Tom Landry. The draft brought a good addition to the offense in rookie FB Eddie Price, who joined veteran HB Gene Roberts in the backfield. Head Coach Steve Owen developed the innovative “umbrella” defense with the Browns in mind, and it had worked well in the two regular season encounters as it stifled Cleveland’s passing attack. There were 33,054 fans in attendance on a bitterly cold day at Cleveland’s Municipal Stadium, with the temperature in the teens. The turf was frozen and the players on both teams wore sneakers. The field had been covered prior to the game and was clear, while the end zones were white with snow. HB Dom Moselle returned the opening kickoff 26 yards to the Cleveland 35 and the Browns started off with a 10-play, 59-yard drive that reached the New York four before stalling. Lou Groza, wearing a sneaker on his left foot and football shoe on his right (kicking) foot, booted an 11-yard field goal to give Cleveland the early lead. The Giants, utilizing the A-formation on offense, were unable to get out of their end of the field for the remainder of the first half. QB Charley Conerly resorted to a quick-kick punt that traveled 72 yards to get out of one jam and, with the teams settling into a battle for field position, the score remained 3-0 at halftime. Early in the third quarter, the Giants reached the Cleveland 49 thanks to a run by Gene Roberts, but a holding penalty set New York back. New York also lost its best receiver, end Bill Swiacki, to an injury that further weakened the offense. On the first play of the final period, the Giants again drove into Cleveland territory. Roberts (pictured below) had runs of six and 26 yards as the visitors reached the 16 yard line. But they came up empty when Eddie Price was thrown for a three-yard loss and a lineman caught a Conerly pass, resulting in a penalty. On their next possession, the Giants appeared on their way to a score when Roberts broke free for a 34-yard gain, but was hauled down by MG Bill Willis at the Cleveland four. The Browns held from there, with several penalties prolonging the series. Among the penalties, a potential touchdown pass for the Giants was wiped out by an offside infraction and an interception in the end zone by DB Tommy James was nullified by a defensive holding call. A motion penalty backed the Giants up and HB Joe Scott collided with his own blocker for a further loss of yardage. Finally, New York settled for a 20-yard field goal by Randy Clay that tied the score. As time ran down, the Browns utilized Otto Graham’s mobility to good effect. The former college tailback ran for a total of 37 yards in the series that went 43 yards and ended with Groza kicking a 28-yard field goal with less than a minute remaining on the clock. The Browns got an additional two points on a safety when Conerly was gang-tackled in his end zone while fading back to try a desperation pass with eight seconds to go. Cleveland won the game and the conference title by a final score of 8-3. In a defensive struggle with little passing offense on either side, the Browns had the edge in total yards (182 to 154) while New York had more first downs (11 to 9). Cleveland had just 29 net passing yards, to 13 for the Giants, with the Browns recording four sacks to two for New York. The Giants turned the ball over twice and Cleveland suffered one turnover. Otto Graham went to the air only eight times and had three completions for 43 yards with one interception, but also ran the ball for 70 yards on 8 carries. HB Rex Bumgardner contributed 39 yards on 12 attempts and HB Dub Jones added 32 yards on 12 runs, while Marion Motley was held to only 12 yards on 7 carries. Dante Lavelli was the top receiver with two catches for 35 yards. 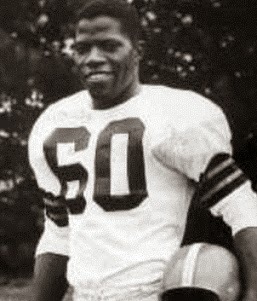 Bill Willis (pictured below) had a huge performance on defense for the Browns, regularly breaking through the New York line as well as preventing a touchdown by catching Gene Roberts from behind on his breakaway run (Paul Brown declared Willis to be “the greatest lineman in American football” afterward). For the Giants, Charlie Conerly was successful on three of 12 passes for 48 yards and had two intercepted. Gene Roberts ran for 76 yards on 12 carries and Eddie Price added 65 yards on 21 attempts. Three receivers had one catch apiece, and end Bob McChesney had the longest gain of 19 yards. “It’s all on the scoreboard,” was Steve Owen’s terse reaction to the loss. The Browns went on to defeat the Rams in a closely-fought NFL Championship game. They would finish back atop the American Conference in 1951, although their string of league titles would end in the rematch with Los Angeles. New York was 9-2-1 in ’51, ending up in second place. The playoff loss to the Browns would prove to be the last postseason game for the Giants with Steve Owen as coach. He was fired following a lackluster 1953 season after 23 years at the helm that resulted in ten postseason appearances and two NFL titles.